This book covers recent developments in process systems engineering (PSE) for efficient resource use in biomass conversion systems. 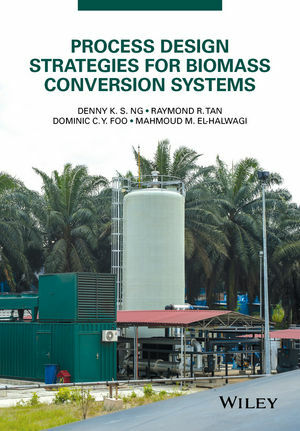 It provides an overview of process development in biomass conversion systems with focus on biorefineries involving the production and coproduction of fuels, heating, cooling, and chemicals. The scope includes grassroots and retrofitting applications. In order to reach high levels of processing efficiency, it also covers techniques and applications of natural-resource (mass and energy) conservation. Technical, economic, environmental, and social aspects of biorefineries are discussed and reconciled. The assessment scales vary from unit- to process- and life-cycle or supply chain levels. The chapters are written by leading experts from around the world, and present an integrated set of contributions. Providing a comprehensive, multi-dimensional analysis of various aspects of bioenergy systems, the book is suitable for both academic researchers and energy professionals in industry. Denny Ng is a Professor at the Department of Chemical and Environmental Engineering, University of Nottingham Malaysia Campus. Raymond R. Tan is a University Fellow and Professor of Chemical Engineering at De La Salle University, Manila, Philippines. He is also Director of that institution's Center for Engineering and Sustainable Development Research. His main research interests are process systems engineering, life cycle assessment and pinch analysis. Dominic Foo is a Professor of Process Design and Integration at the University of Nottingham Malaysia Campus. He is a world leading researcher in resource conservation with process integration techniques, and has two forthcoming books and over 180 scientific papers. He is the winner of the Innovator of the Year Award 2009 (Institution of Chemical Engineers, UK) 2010 Young Engineer Award (Institution of Engineers Malaysia (IEM), Outstanding Young Malaysian Award 2012 (Junior Chamber International, JCI) and winner of the SCEJ Award for Outstanding Asian Researcher and Engineer 2013 (Society of Chemical Engineers, Japan). Mahmoud M. El-Halwagi is Professor at the Artie McFerrin Department of Chemical Engineering at Texas A&M University. Prof El-Halwagi is the author of three textbooks on process integration and sustainable design and more than a 150 papers and book chapters in the fields of sustainability, biorefining, and integrated process design.